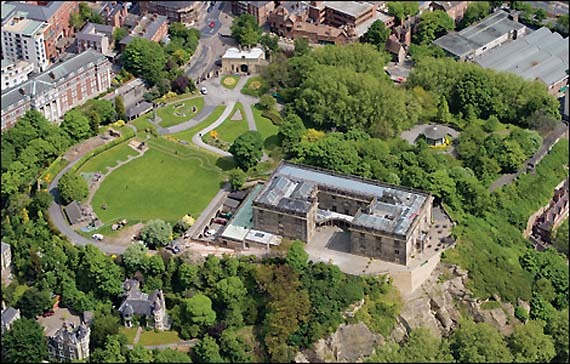 On the other side of the road is the City Hospital and the large space in the bottom right hand corner north of Perry Road is HM Prison Nottingham. 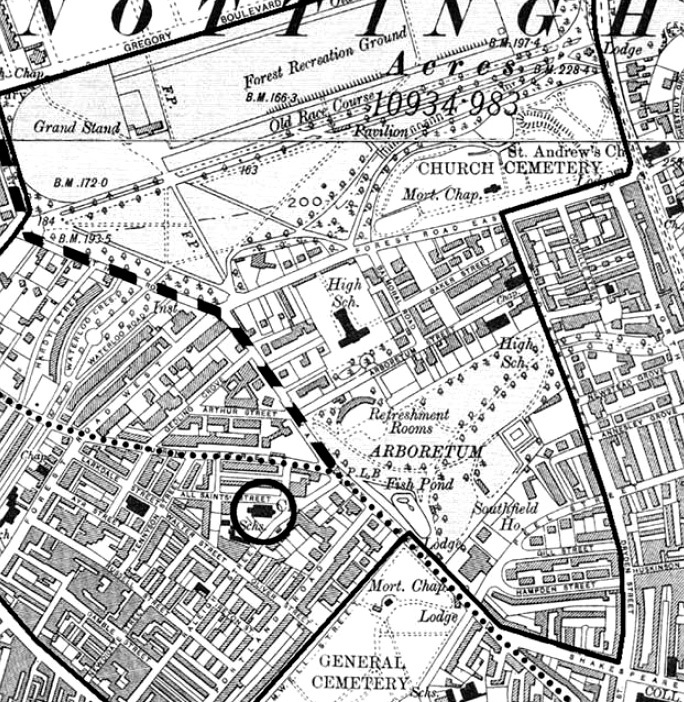 The school bought the 18 acres of land for the new playing fields on Valley Road in 1929, largely with money from JD Player, the Old Boy and cigarette millionaire. The total cost was £5,600, with £13,000 more needed to level the site, returf the surface, and build a new pavilion. 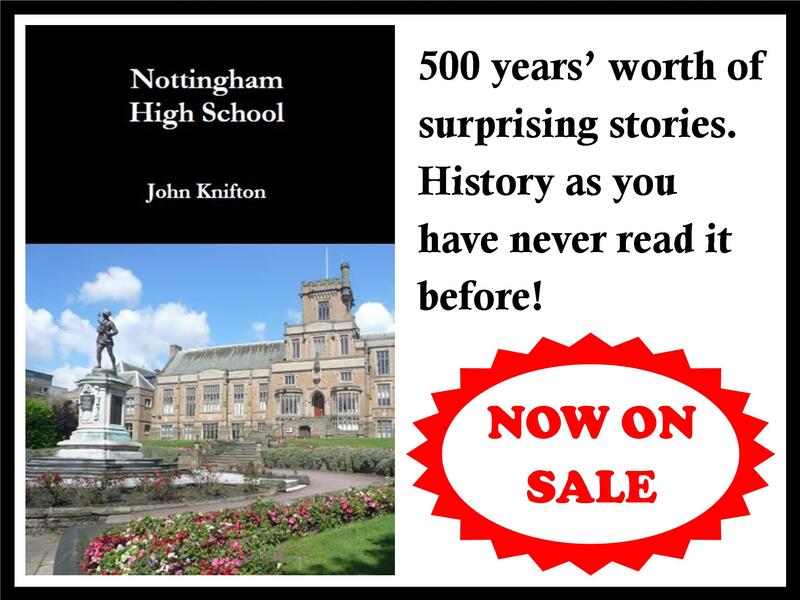 The Headmaster and JA Dixon, the Notts County and England footballer and Nottinghamshire cricketer, had looked at more than twenty sites before the decision was made. 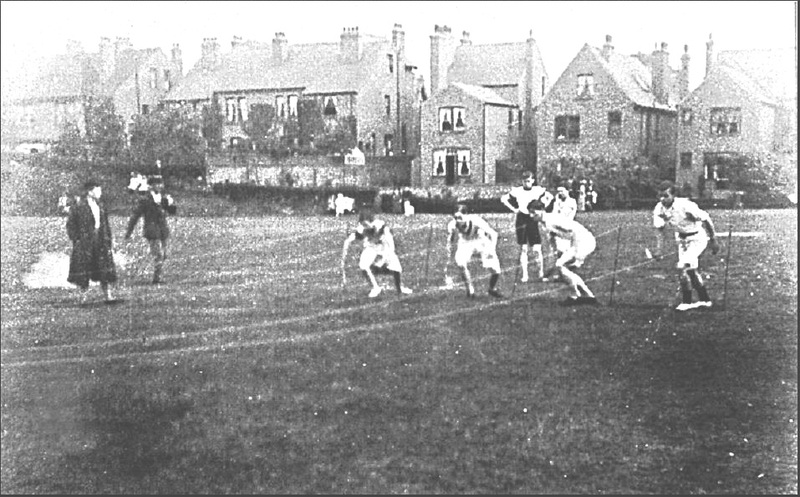 Until this time, the school had played its representative matches at Mapperley Park on Mansfield Road, with house and form competitions played on the Forest Recreation Ground. The old Mapperley Park ground was sold to the City Corporation for £6,750 and the rest of the money for developing the site, some £6,000-£7,000, was raised by the Old Boys. 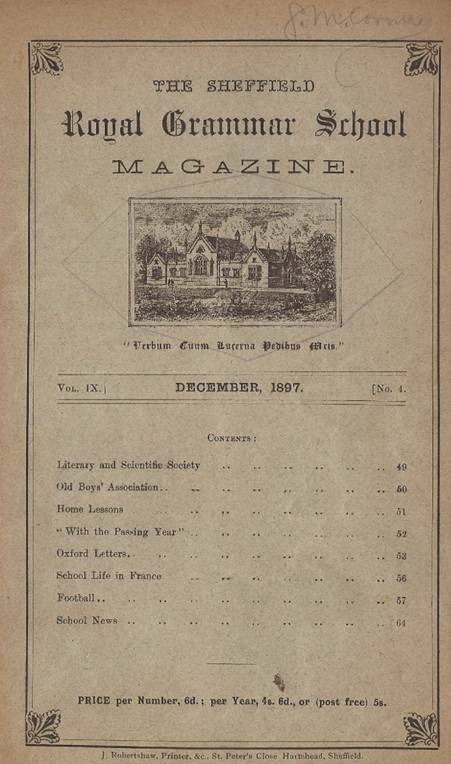 In December 1931 the School Magazine included a three page list of subscribers who had given money to support the appeal to develop the School’s new playing fields at Valley Road. Overall, a total of some £434 2s 6d had been raised. 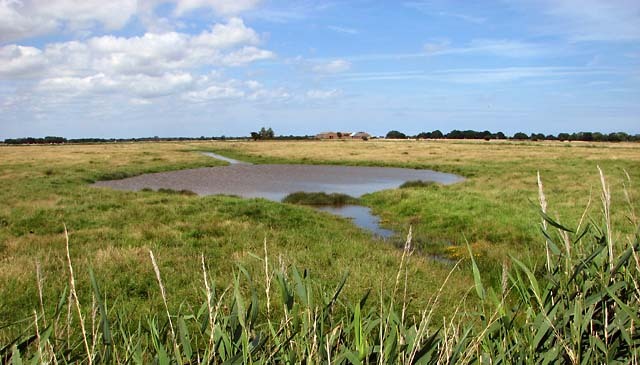 The most generous benefactors were Messrs E Bignall and W Bignall, HR Gillespie, JC Joynes, F Limpenny, FW Pare, L Pilsworth, TS Ratcliffe, GT Rigley and AS Rigley, HB Rose and EB Stocker, all of whom contributed ten guineas. In the least generous category, however, were the three who could only be persuaded to hand over 2s 6d. Arguably though, the finest human being of all was the bank, whose interest payments amounted to £12 2s 6d. Next time, Technicolor © is invented. 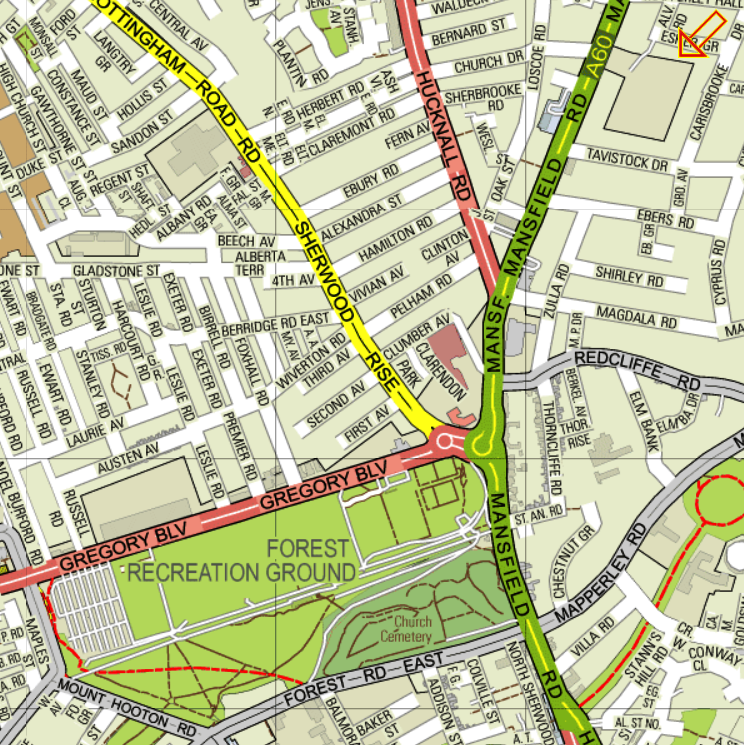 If you look at this larger map, you can see that Gorsey Road is not too far away from the High School which is in the bottom left corner in the area between Arboretum Street, Forest Road East and Waverley Street. 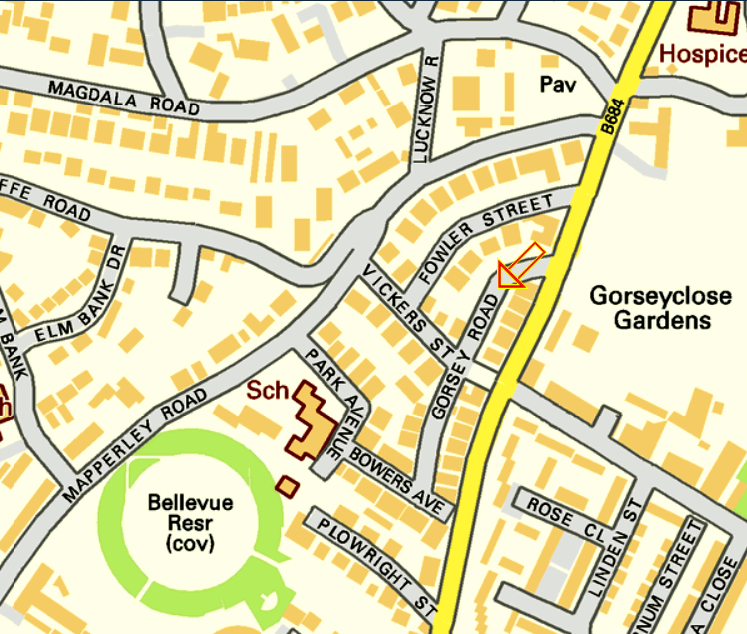 The School is on the corner either side of the pale green patch. 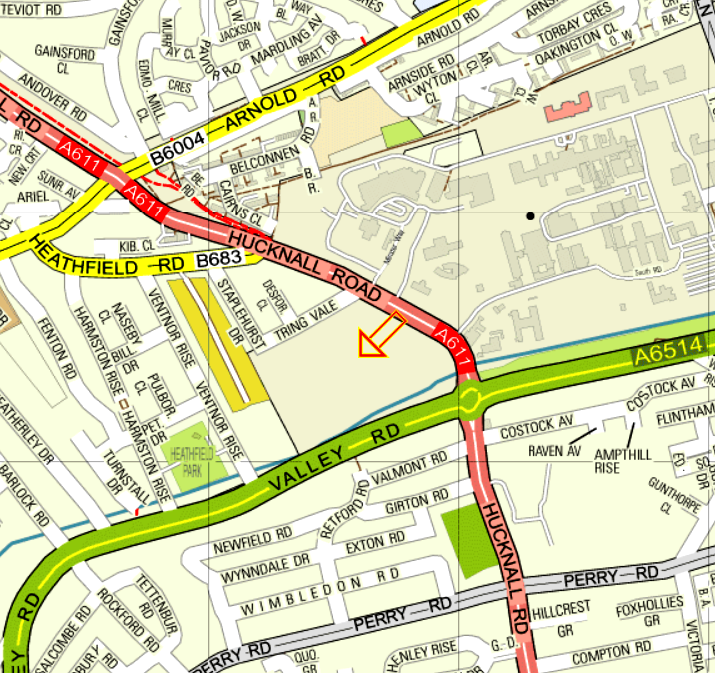 Gorsey Road, I should have said, is again indicated by the orange arrow. 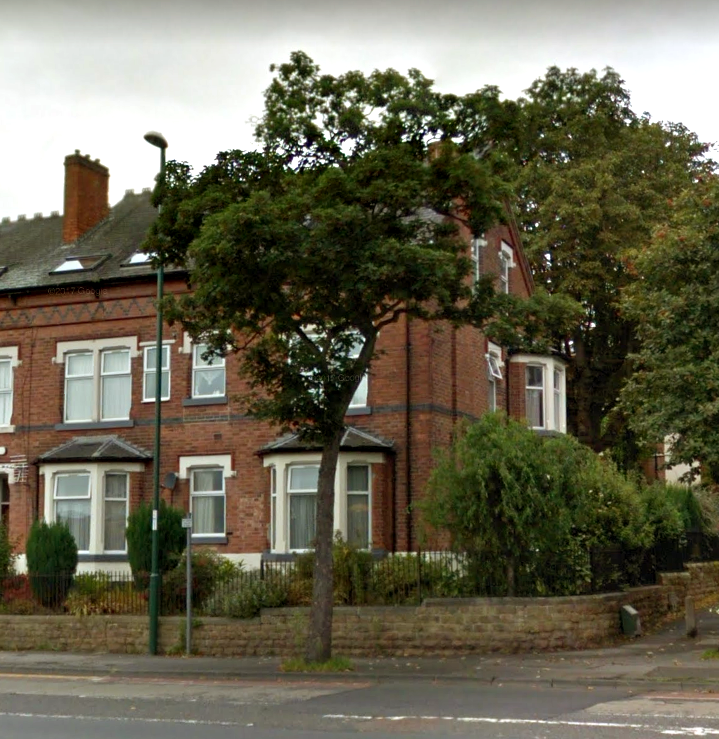 Three years or so later, when all of the information had been collected for the 1928 edition of the Kelly’s Directory, the house in Gorsey Road was now recorded as being occupied by Mrs Ann Elizabeth Peet. She was presumably NG Peet’s mother, rather than his wife. At this time her son was still in his early twenties and it is by no means surprising that he was still living in the parental home. There is certainly no NG Peet listed as living elsewhere in Nottingham, nor indeed in the rest of the county. In 1929, the High School prepared its own list of the Old Boys’ addresses. 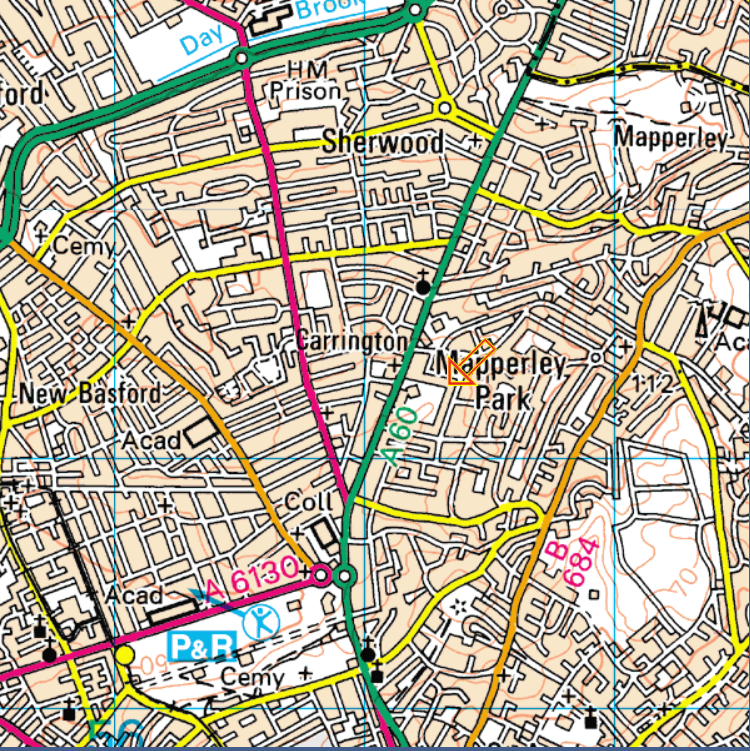 In that, NG Peet is listed as still living at 2 Gorsey Close although it could just be that they carried an old address forward. NG Peet, incidentally, I should have introduced him earlier. He is Noel Gordon Peet, who was born on December 26th 1901, hence the name. His father was William George Peet who was a “General Agent”. Six years later, in 1925, the relevant Kelly’s Directory listed William George Peet as working for “WG Peet, Son & Company”. By 1928, he is listed as a “yarn merchant” operating from Kaye’s Walk. His telephone number was listed as “TN 42769” and his telegraphic address as “Knitiarns”. Noel packed a lot into his two and a bit years at the High School. 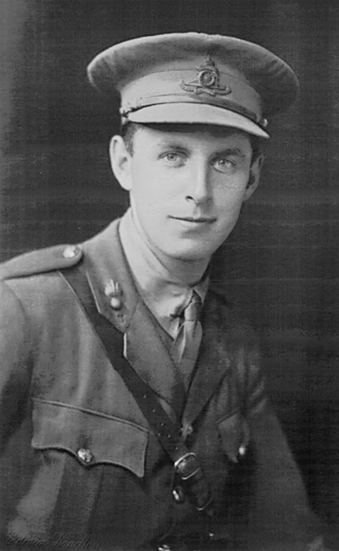 He won the Fifth Form B Prize in 1918 and the Fifth Form Writing Prize in the same year. In 1919, he won the Sixth Form B Prize. 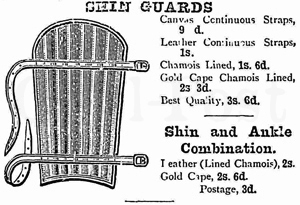 In the Officer Training Corps, he became a Corporal in 1918 and a Sergeant in 1919. In cricket, he won the School Prize for Batting in the same year. He had 13 innings and scored a total of 144 runs at an average of 11.07. His top score was 36. Not a classic season for the School apparently ! Also listed in the High School’s list of Old Boys in 1929 was William Ronald Peet, Noel’s younger brother. He too is recorded as living at No 2 Gorsey Close. He was born on October 9th 1910 and entered the High School as Boy No 4036 on May 1st 1919. He left in December 1926 at the end of the First Term. 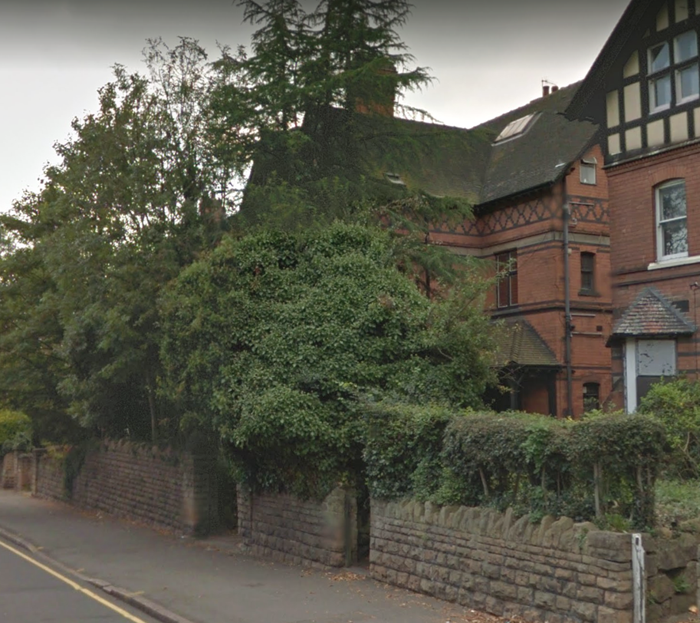 By the time William entered the School, the family had moved from Mansfield Road and were living at Sutherland Lodge in Lucknow Drive in Mapperley Park. The boys’ father is listed as a “manager”. Lucknow Drive, or rather the word “Lucknow”, is visible in the top right corner of the second map above. “I am not prepared to withdraw, modify or apologise for anything I have said on this matter, and I propose to repeat the words I made use of and about which complaint has been made. The Word Detective is unable to supply a guaranteed origin for “Dab”, but I suspect that he is right to say that it comes from “dapper” which means “neat, elegant, smart, stylish or well-groomed”. Dab certainly proved to be a dab hand at a great many things in his time at the High School, not least in his academic subjects. In 1912, after his first year, for example, he had clearly impressed enough to become a Foundation Scholar. Dab finally left the High School in May 1918. He was always one of the favourites of Sammy Corner, the Deputy Headmaster, especially in the Latin and Ancient Greek classes in the Lower Sixth. As a teacher, Mr Corner was famous for how easily he could be diverted from the work in hand. If anybody started talking about an interesting subject, especially in his Scripture lessons, the class would seldom, if ever, have to return to what they were supposed to be doing. Dab’s other claim to fame was his talent in school plays. At this time, all the female parts were taken by boys, and, given his youthful good looks, Dab could always be made up into a very good looking girl or lady! Perhaps this was what made him an especially “Dab hand”. The High School had stopped playing football, or soccer, at the end of the Christmas Term in 1914, ironically, just in time for the Christmas Truce in the Great War. 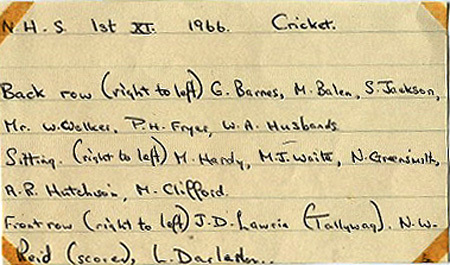 The First XI finished with a 2-7 away defeat against Leicester Wyggeston School on November 25th 1914. The Second XI, playing at home at Mapperley Park against the same opponents’ 2nd XI, lost by 1-5. Dab probably did play for the High School at football, but we have no record of any of the team line-ups for this shortened season. 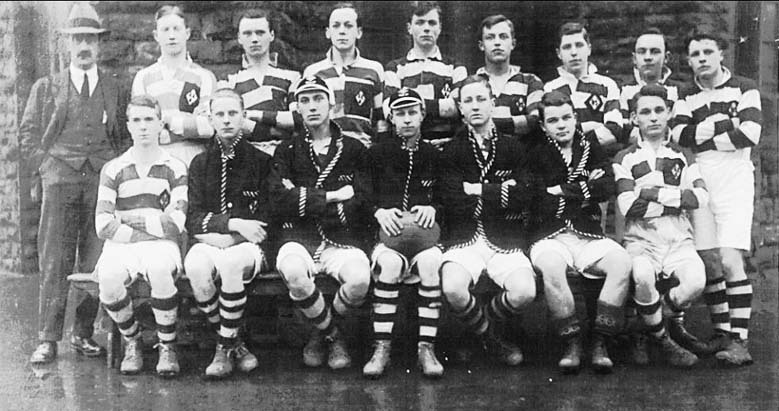 When the school began playing rugby in early 1915, they did not play any official fixtures, but instead, spent their time trying to learn this rather complex game. The next season, on June 10th 1916, Dab travelled to Parker’s Piece, Chester Green, Derby to play against Derby School. 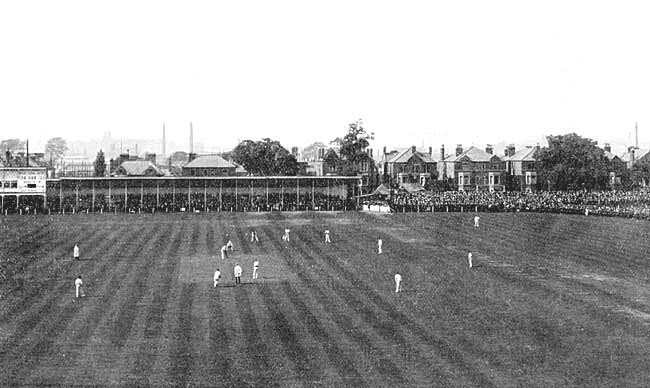 This venue has been used for cricket from 1883 to at least 2006. Derby managed a record breaking low score of only 13 runs. JH Boyd took five wickets for only seven runs and GA Wright claimed four wickets for two runs. The rest of Derby’s total came from four extras. 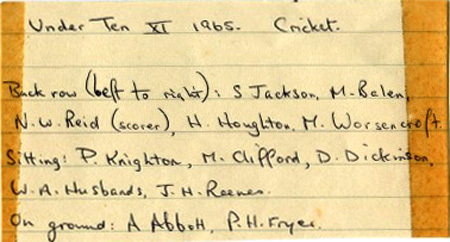 When the High School batted, Dab opened the innings as number two, and scored just three runs before he was out caught by Cotterill of the bowling of Stray. The High School, not surprisingly, were the victors, and batted on to score 158 all out. Nowadays, the area has clearly gone downhill with even horrific dog attacks being reported there. Such things were clearly not a hazard in those bad old days of 1916! 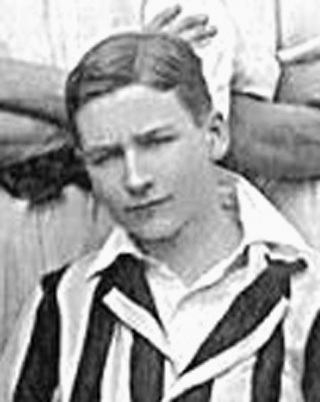 The following year, in 1918, he was the Captain of Cricket, although this cannot have lasted long if he was to leave the school in May of that year. Tomorrow, more about the life of Percival Henry Biddulph Furley. As well as John Francis Haseldine, another High School footballer has carved his initials on the stone mantelpiece of the ground floor fireplace between the General Office and the entrance to the Assembly Hall. 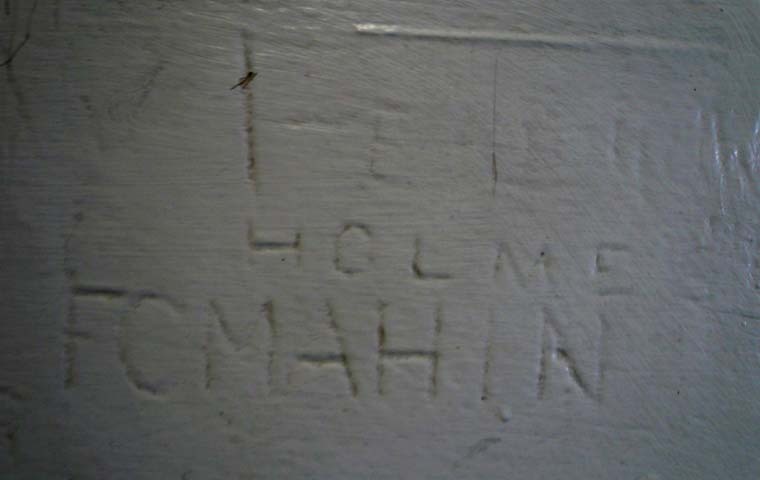 This footballing vandal is “F.C.Mahin”. Frank Cadle Mahin is one of the most interesting of the school’s pupils. He was born on May 27th 1887, in Clinton, Iowa, the son of Frank W. Mahin, who was a retired United States Consular Officer at the time. 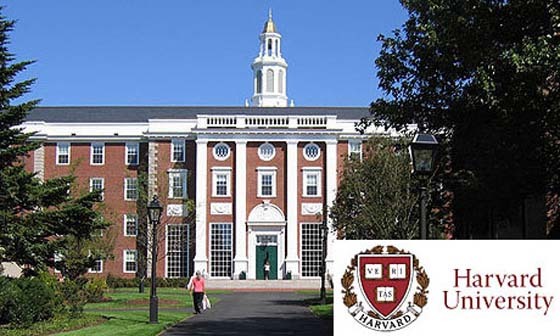 Frank W. had graduated from Harvard University in 1877. Frank C.’s mother was Abbie Anna Cadle, who was born in Muscatine, Iowa, in 1857 to Cornelius Cadle and Ruth Lamprey. This was Abbie’s second marriage. She had previously been married to Frank Mann with whom she had one child. With her second husband, Frank W., she had two more children, Frank C., and a daughter, Anna, who was born in 1880. Anna was to meet a young English doctor during the family’s stay in Nottingham, and she remained with him after her parents eventually left England for Amsterdam in Holland. I have been unable to trace Anna’s husband’s surname, although he was to become Frank’s Uncle Alec. As an Englishman, Alec was to fight in the Great War well before Frank and his fellow Americans became involved in the hostilities. Alec was certainly in combat as early as 1915, and I believe that he survived the conflict. The year of Anna’s death has not been recorded. Her mother, Abbie, died in 1941 at the age of 84. Despite a comparatively short stay at the High School, Frank Junior seems to have been an accomplished sportsman, and appeared for the First XI at football in a fixture against Loughborough Grammar School on Wednesday, October 25th 1904 at Mapperley Park. The High School began very slowly and had quite a fright before they eventually ran out victors by 4-1. The team was M.J.Hogan, J.P.K.Groves, R.Cooper, R.E.Trease, R.G.Cairns, F.C.Mahin, H.E.Mills, S.D.M.Horner, R.B.Wray, L.W.Peters and P.G.Richards. This time the team was M.J.Hogan, R.B.Wray, R.Cooper, R.E.Trease, R.G.Cairns, F.C.Mahin, H.E.Mills, J.Henson, L.W.Peters, C.R.Attenborough and P.G.Richards. The team was M.J.Hogan, J.P.K.Groves, W.E.Williams , F.C.Mahin, R.B.Wray, R.E.Trease, H.E.Mills, C.S.Robinson, S.D.M.Horner, L.W.Peters and P.G.Richards. The detectives among you will notice that it is warm enough for the changing room windows to be open, and the design of the ball is very different from nowadays. 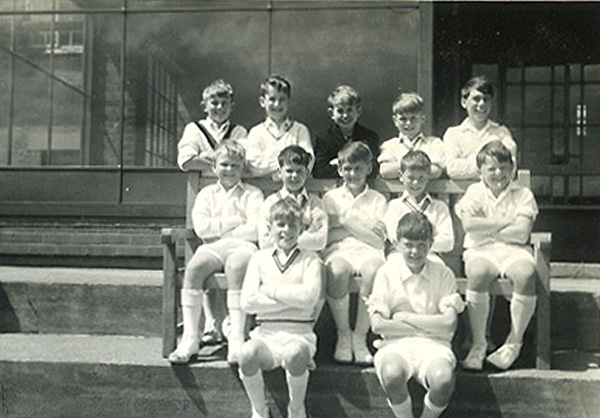 Young Horner has forgotten his football socks, and, because this game marked his début for the side, Mr Fryer’s mother has not yet had the time to sew his school badge onto his shirt. Frank is, in actual fact, in the full school uniform of the time, which was a respectable suit or jacket, topped off with a neat white straw boater, with a school ribbon around it. Frank was perhaps a better cricketer than footballer, and he was, in actual fact, the regular captain of the Second XI at cricket. 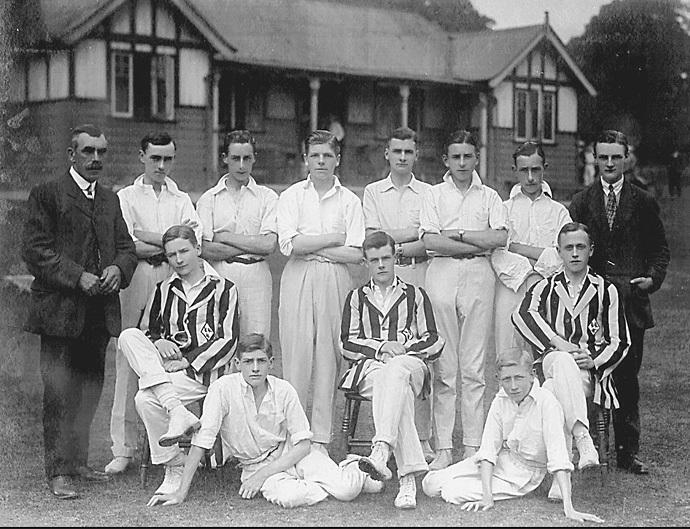 This photograph shows the First XI cricket team, in an unrecorded year, probably 1905. The individuals are thought to be on the back row, Mr.A.G.Onion, (Groundsman and Coach), S.D.M.Horner, R.G.Cairns, C.F.R.Fryer, unknown and F.C.Mahin. In the middle row are P.G.Richards, L.W.Peters, W.G.Emmett (Captain), M.J.Hogan and R.B.Wray. Seated on the grass are J.P.K.Groves, H.E.Mills, and an unknown player. In his time at the High School, Frank played for the First XI cricket team only sporadically. We know that he batted once in the 1904 season, and scored five runs, and then batted once more in 1905, and obtained the same score. In addition, we also know that, on Saturday, June 24th 1905, which was School Sports Day, Frank dead-heated for first place in the Open Long Jump, managing a jump of fifteen feet nine inches, exactly the same distance as C.F.R.Fryer. In the academic world, Frank won the Mayor’s Prize for Modern Languages, and, most significant of all, perhaps, he reached the rank of sergeant in the newly formed Officer Training Corps. Frank left the High School in July 1905, and returned to the United States where he was in the Class of 1909 at Harvard University. Frank’s close contemporaries included Franklin Delano Roosevelt, and two sons of the current President of the time, Theodore Roosevelt. They were called Theodore and Kermit. Both of these men had the same interest in the military as Frank. In 1917, Kermit Roosevelt, although he was obviously an American, joined the British Army to fight in Mesopotamia during the Great War. He was awarded a Military Cross on August 26, 1918. Theodore Roosevelt served as a Brigadier General in the United States Army during the Second World War. He died in France in 1944, a month after leading the first wave of troops onto Utah Beach during the Normandy landings. This brave act was to earn him the Medal of Honor. To me, it would seem ludicrous to suggest that they were not, at the very least, among Frank’s acquaintances at Harvard, if not friends. Hopefully, Frank had little or no association with another famous member of the Class of 1909. This was Ernst Hanfstaengl, a prominent member of the German Nazi party in the 1920s and early 1930s. A close personal friend of the Führer, Hanfstaengl provided part of the finance for the publication of “Mein Kampf” and the Nazi Party’s official newspaper, the “Völkischer Beobachter“. Using his experience of Harvard football songs, he composed many Brownshirt and Hitler Youth marches and also claimed to have invented the “Sieg Heil” chant. Eventually, “Putzi” was to defect to the Allies and to work as part of President Roosevelt’s “S-Project”, providing information on some 400 prominent Nazis. During his time at Harvard, according to the Secretary’s Second Report on the Harvard College Class of 1909, Frank married Miss Carrie Knight Whitmore on December 10th 1906. 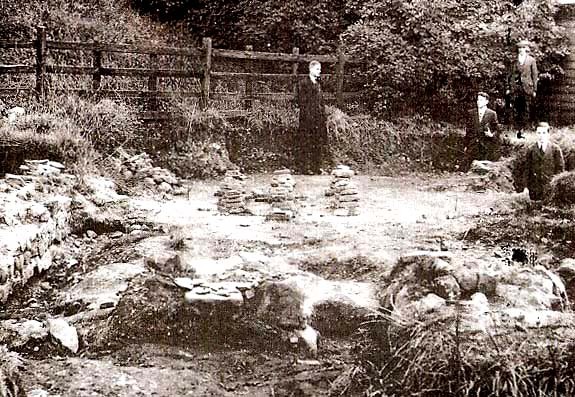 Alas, the poor lady was to die on February 11th 1907. Details are lacking, unfortunately, but this was an era where women could die not only giving birth to a child, but even of morning sickness in the early part of a pregnancy. The same source reveals that Frank remarried on August 18th 1908 in New York, New York State. The lucky lady was called Miss Sasie Avice Seon. The association football team will play its first game of the season with Columbia this afternoon at 2 o’clock on Alumni Field, New York. Individually the team is strong; but, as several of the men have only recently joined the squad, the team work is not well developed. Captain Thackara will be in the line-up today for the first team this year. Columbia finished second in the intercollegiate league last year and defeated Yale last week in a well-played game by the score of 4 to 0. Tomorrow the team will leave for Ithaca, and will play Cornell on Monday afternoon, returning to Cambridge that night. “The association football team defeated Columbia on Saturday at Alumni Field, New York, by the score of 1 to 0. With only ten men in the line-up, Columbia was unable to block the clever attack of the University team, and was on the defensive during most of the game. The single goal was scored in the first half after a series of speedy passes by the forwards to A. N. Reggio, who sent the ball into the net. Osborne, the University team’s centre forward, played an excellent game, and continually broke up the Columbia attack before it was fairly started. Two 30-minute halves were played. Harvard vs. Cornell at Ithaca Today. This afternoon, the team plays Cornell on Percy Field, Ithaca. Last month Cornell defeated Columbia by the score of 2 to 1, and has a fast, aggressive team. “ITHACA, N. Y., Dec. 3.–On a field covered with snow the association football team defeated Cornell this afternoon on Percy Field, by the score of 5 to 1. In spite of the unfavorable conditions, the University team played well and showed a marked improvement in team work over the form in the Columbia game. Cornell’s defense was unable to check the hard attack of the University forwards, and but for the snow which made accurate shooting impossible, the score would have been larger. Of the five goals, Osborne made three, and Biddle and A. N. Reggio one each. Cornell’s goal came after a hard scrimmage in front of the net, following a kick out from the corner of the field. Two thirty-minute halves were played. “The University association football team will play Haverford this afternoon at 2.30 o’clock in the Stadium. As neither team has been defeated this fall, the game today will decide the intercollegiate league championship. The University team has improved steadily during the season and has developed an effective attack, as shown in the Cornell game last Monday. Haverford has a well-balanced, team of experienced players, many of whom played on last year’s championship team. Last month they defeated Columbia by the score of 2 to 1, while the University team defeated Columbia, 1 to 0. The privileges of the Union are extended today to all Haverford men. D. J. Pryer has been elected captain of the Brown University football team for next year. “The University association football team was defeated by Haverford on Saturday in the intercollegiate championship game by the score of 2 to 1. Haverford’s light forwards were very fast and displayed better team work than the University players, who depended almost entirely on individual work. On the defense, the University backs were not given enough assistance by the forwards. For the University team, Brooks and A. N. Reggio played especially well. In spite of a constant guard of two Haverford players, Osborne played his usual good game. In the second half, several opportunities to score were lost by the University forwards through inaccurate kicking. Baker, Haverford’s centre forward, played brilliantly and was the most untiring player on the field. Haverford won the toss and chose to defend the north goal with a strong wind behind them. During the first half, Baker made two goals, aided by fast team work on the part of the other forwards. Shortly after the beginning of the second period, A. N. Reggio scored Harvard’s only goal. “Brentford–Stroke, C. L. Hathaway ’10; 7, J. F. Frye ’09; 6, J. 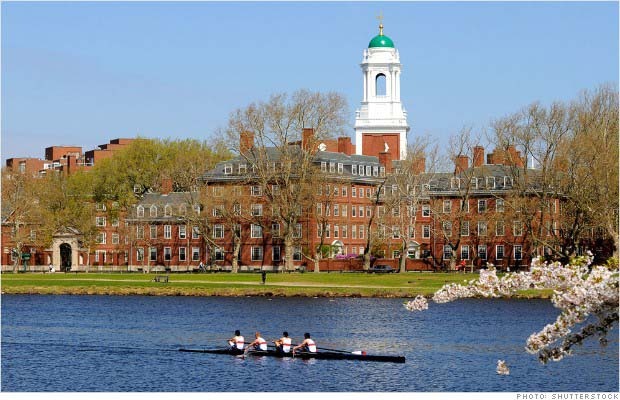 A. Curtis ’10; 5, W. F. Doake ’09; 4, P. N. Case ’09; 3, I. E. Willis ’09; 2, F. C. Mahin ’09; bow, H. F. Bingham ’10; coxswain, E. B. Gillette ’10. Division I–1, Claverly; 2, Mt. Auburn street; 3, Dunster-Dana-Drayton; 4, Randolph; 5, Westmorly; 6, Craigie-Waverley; 7, Russell. Division II–1, Thayer; 2, First Holyoke; 3, Hampden; 4, Holworthy; 5, Perkins; 6, Matthews; 7, Weld. 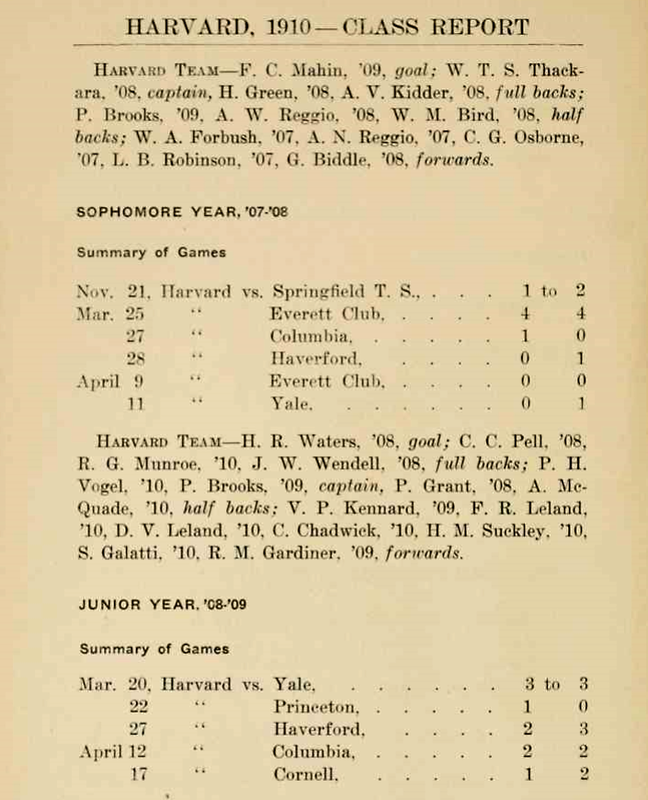 Division III–1, Foxcroft-Divinity; 2, Grays; 3, Second Holyoke; 4, Hollis-Stoughton; 5, Brentford; 6, College House. “At the meeting of candidates for the cricket team last night, the following handed in their names: W. P. Phillips 2L., R. M. Gummere 3G., N. L. Tilney ’06, C. G. Mayer 2L., C. G. Osborn ’07, A. W. Reggio ’08, R. N. Wilson 1G., A. N. Reggio ’06, H. R. Waters ’07, N. B. Groton ’07, T. E. Hambleton ’07, L. C. Josephs ’08, E. M. B. Roche ’09, A. E. Newbolt ’09, A. L. Hoffman ’09, F. C. Mahin ’09. Frank was really quite bored with life at Harvard though. He wanted to be a soldier. After two years of university life, he left Harvard to join the Regular Army, not as an officer, but as a private soldier. I will take up his fascinating tale in another blog post. This photograph shows the Officer Training Corps in 1915. You might be forgiven for thinking that they are all far too young to have left the High School, to have immediately joined the army, trained as officers, gone to the Western Front and then been killed. But you would be wrong. 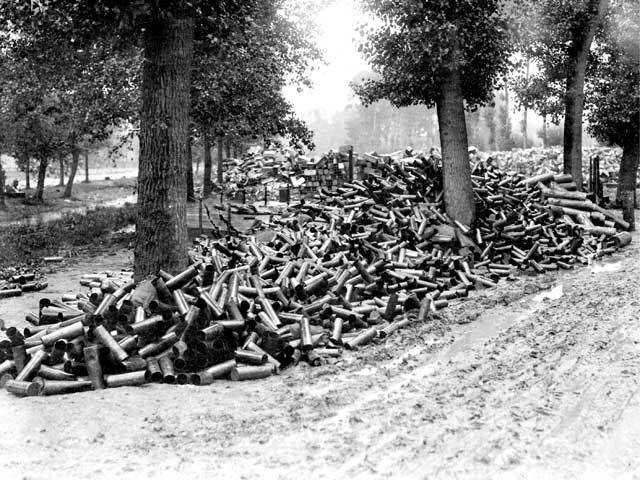 This time, it was only three dead out of twelve though, and this represents a much better casualty rate than the rugby team of Boxing Day, 1913. On the other hand, though, it is still a staggering 25%! 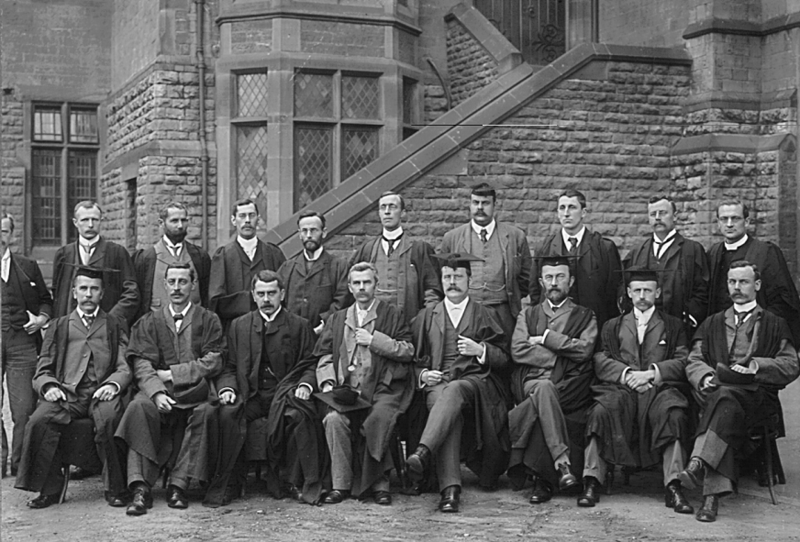 On the back row of the photograph are, from left to right, F.A.Bird, J.R.Coleman, D.J.Clarkson, J.Marriott, A.W.Barton, G.R.Ballamy, S.I.Wallis and W.D.Willatt. 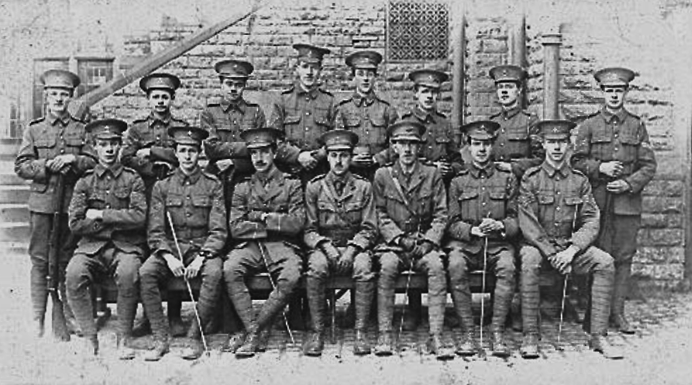 On the front row are, from left to right, L.W.Foster, V.G.Darrington, Second Lieutenant J.L.Kennard, Captain G.F.Hood, Second Lieutenant L.R.Strangeways, G.James and R.I.Mozley. 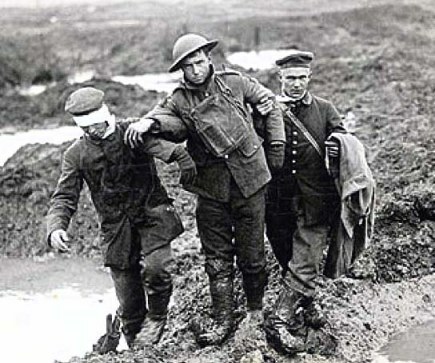 Presumably, if they had got to the Front in time, Messrs Leggett and Morgan would have been able to encourage the soldiers during the Christmas Truce to forget the football and play rugby across no-man’s-land. In 1925, the School was feeling the financial pinch and seems to have been, on occasion, extremely strapped for cash. Mr Hood, along with Mr Betts, offered to install electric lighting in part of the school while their classes were taking examinations. The offer was eagerly accepted, presumably in the days before that fateful phrase, “Health and Safety” had quite the ring to it that it has now. In July 1946, Mr Hood retired after decades of service to the school. After 38 years as a dedicated teacher, his departure was marked in the school magazine by a warm tribute and farewell which lasted for just a line and a half of print, and must have been quite a bit short of one word for every year. Inside the classroom, Mr Kennard was a teacher of Modern Languages and his nickname was “Guts”. 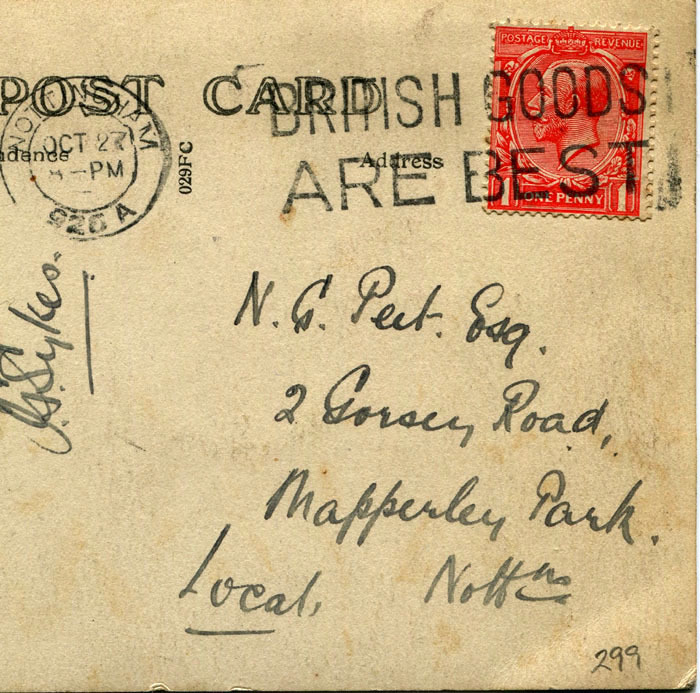 When Mr E.P.Gaskin, the Head of Languages, retired in July 1927, he was succeeded by Mr Kennard. Around this time, Mr Kennard became the Housemaster of Mellers. Mr Strangeways left the school in 1918. He went to Bury Grammar School where he was Headmaster from 1919-1936. The school still has its Strangeways Library. In my next blog post about this photograph, I will try to find out what happened to the boys in the years after it was taken. Nowadays, School Sports are held in April and can be, just occasionally, on the rainy or even the chilly side. The first School Sports I have been able to find any information about took place over two days, well over a hundred years ago…and not in April. Instead, they were on Wednesday and Thursday, September 28th and 29th 1870, at Trent Bridge. (not for the first time, apparently). Events included the popular “High Leap with a Pole”, won by Woodhouse with a jump of 7ft 6ins, “a good jump for a man”. A total of 36 boys entered the stone gathering race, and the sack race was won by Darby, who had the bright idea of inserting a toe tightly into each corner of the sack, and then “shuffled along capitally”. A number of gentlemen finally took part in this race, running in top hats and overcoats. As expected, Mr Widdowson was in first place, with Mr Frederick Rothera second. There was a “blind donkey race” with large boys blindfolded, and small boys riding piggyback, giving them directions. It was won by “Purchase and Brown”. The next School Sports I can trace were on Monday, April 8th 1878, at Trent Bridge, in front of a “numerous gathering”, entertained by the playing of the Sax Tuba Band. Events included throwing the cricket ball, a 220 yard football dribbling race, a 100 yard three-legged race, a 100 yard sack race, a one mile bicycle race, and an Old Boys’ race. One of the highlights was the 220 yards running race when the course had been marked out wrongly. One of the eleven runners, Sulley, took the wrong turning, and “effectually disposed of his chance”. The other runners also went wrong, but because they were trailing so far behind Sulley, they were able to run back, and get onto the correct route. Unfortunately, Small was knocked over in the confusion, and eliminated from the race, which was eventually won by G.F.Chalcraft. His prize was a handsome desk, donated by the teaching staff. 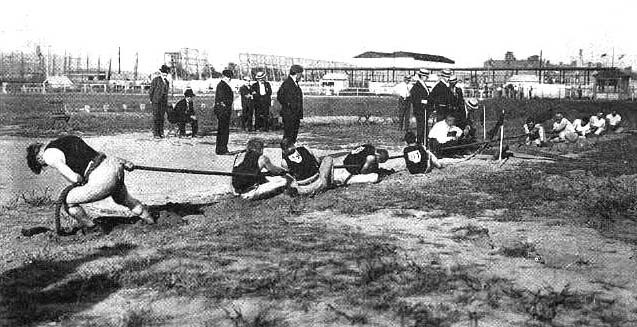 In the final of the sack race, F.Bailey finished second behind “the younger Walker”, having decided not to jump inside his sack, but instead, to lie down and roll along the ground. 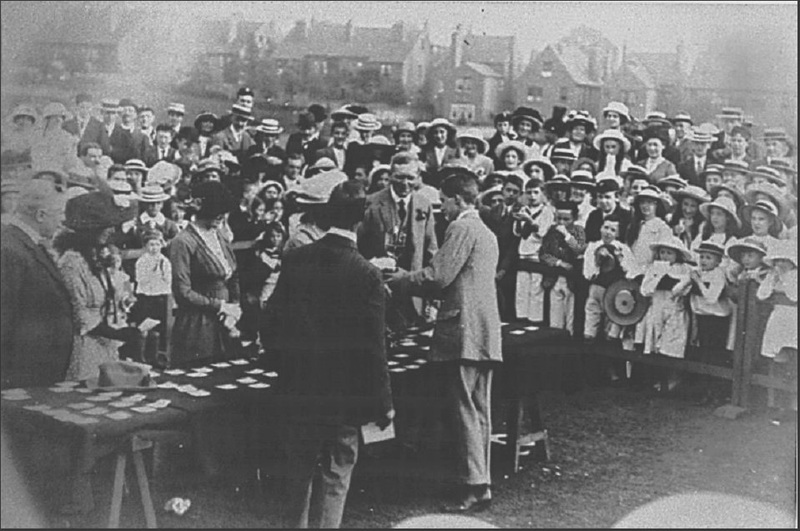 There was a half mile handicap race where the prize was a silver watch, presented by Captain W.E.Dennison M.P., and the M.P., Saul Isaac. J.E.Woolley led for nearly six hundred yards, but Barlow overcame his ten yard handicap about 120 yards from the finish, and went on to win. Woolley eventually finished third, and C.Cullen was second. The prize in the long jump was a luncheon basket, presented by the Borough Members. There was a three-legged race and a 400 yards race with only two competitors, G.B.Chalcraft beating E.H.Wells by ten yards. In actual fact, there should have been three runners for the race to start at all, but it was “run through an error on the part of the starter.” The one mile handicap bicycle race was won by A.V.Paton, and F.Bailey won the sack race. This event “…as usual, afforded great amusement.” C.Cullen won the 220 yards football race. His first prize was a cabinet Shakespeare, presented by the Dame Agnes Mellers Club. E.Thornley was doing very well until he kicked the ball out of his lane, and Cullen then went on to win. 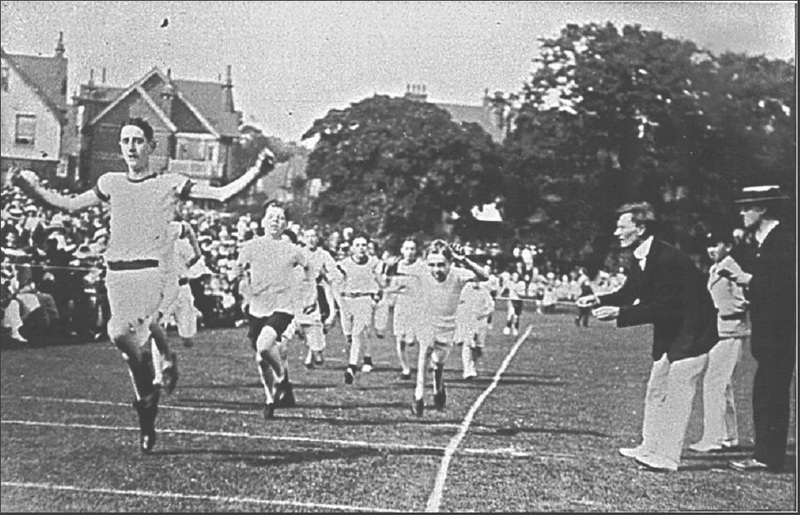 H.R.Bramwell won the 100 yards hurdles, which was over six flights of hurdles. His prize was a writing desk, presented by Messrs J & J. Vice. In the 220 yards, C.Daft won a pair of binoculars presented by the Assistant Masters. “The most exciting race”, was the Old Boys’ race over 220 yards won by F.F.Cleaver in 24 seconds. 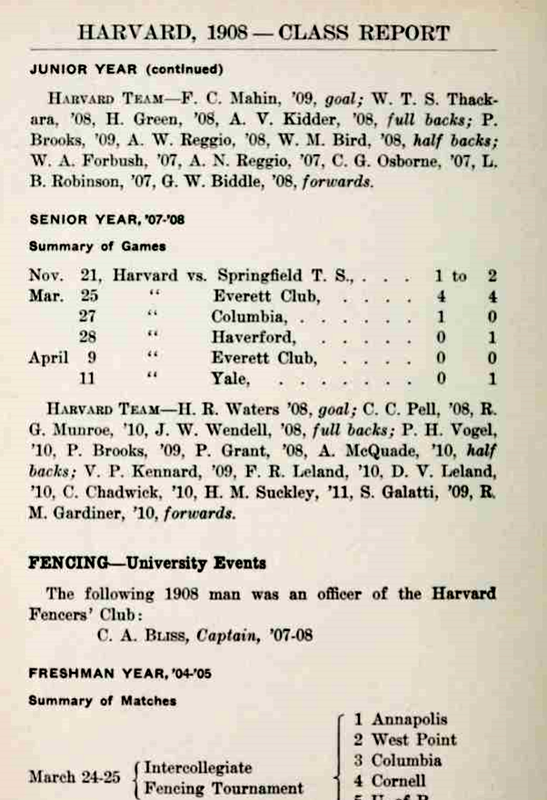 At the end of the day came the “…usual bumping match and two consolation races”, won by Thornley and Butler. Mr Charles Daft was the starter throughout, and Herr Altdorfer and Mr W.H.Bailey were the judges. The prizes were presented by Miss Lindley, and the President seconded a vote of thanks to her for her kindness. She was given a small bouquet of flowers, and three cheers by the school. Her father offered thanks for this kind gesture, and then called for three cheers for the President. With this, the day came to a happy close. One interesting detail about the competitors in these sports is that there was a small fee payable to enter any of the events. 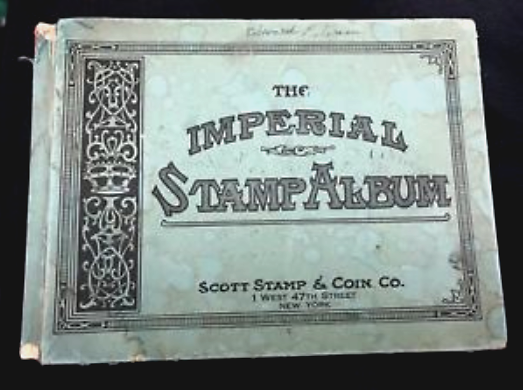 At least one Old Boy in later life was to state that this cash payment did much to limit the number of competitors. 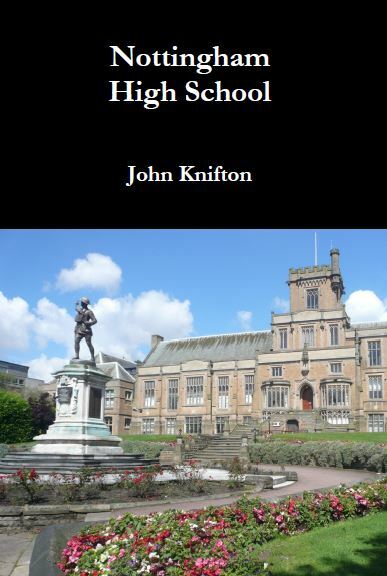 School Sports then seem to have died a death until, during his first term in office, in March 1885, the new Headmaster, Dr James Gow, started an Athletics Contest for senior boys. This soon evolved into a full School Sports Day. Over the years, the school magazines have given us a series of snapshots of the event has changed. There was a good attendance of spectators, and among the more usual events was a three-legged race, won by W.A.Möller and C.P.S.Sanders, a sack race won by J.Blake, and a bicycle race over one mile, won by W.A.Möller in 3 minutes 45.4 seconds. 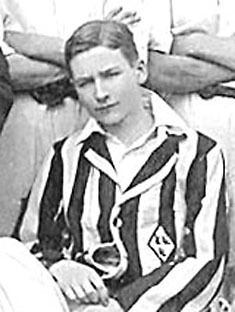 F.Bramley won the “Throwing the Cricket Ball (for boys under 14), with a distance of 57 yards. The Masters’ Race was won by the Reverend T.W.Peck, with Mr W.T.Ryles in second place, two yards behind. There was also an Old Boys’ Race which was a handicap, run over 220 yards, and a Tug of War, won by Team No 1, who defeated Team No 2 in the final. Again many prizes were in evidence, all presented by Mrs.Gow. On the afternoon of Tuesday, June 3rd 1890, Sports Day was again held at the Castle Ground in dull and windy weather. Nevertheless, a large crowd attended, and enjoyed a day of “very fair sport”, and a selection of music played by the Nottingham Borough Police Band, under the leadership of Bandmaster Redgate. The prizes were presented by Miss Goldschmidt. 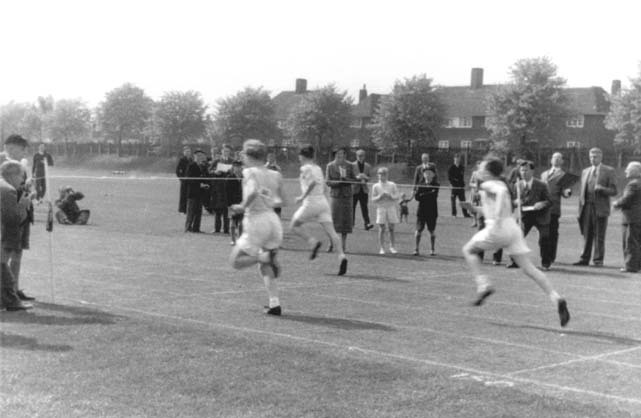 Most of the events were similar to previous years including the 220 yards football dribbling race, throwing the cricket ball, an Old Boys’ bicycle race, a sack race and a whole series of running races, all of them with varying handicaps for the competitors . The most interesting event, though, was the hundred yards Medley Handicap. In this, boys competed in a number of heats over one hundred yards, and the handicap consisted in the means by which they had to cover the distance. The methods included skipping, sack race, three legged, pick-a-back, on all fours, and, most spectacular of all, perhaps, on stilts. The final seems to have been a normal foot race, as the winner’s time was fifteen seconds. On Saturday, June 24th 1905, it was very fine weather at Mapperley Park. 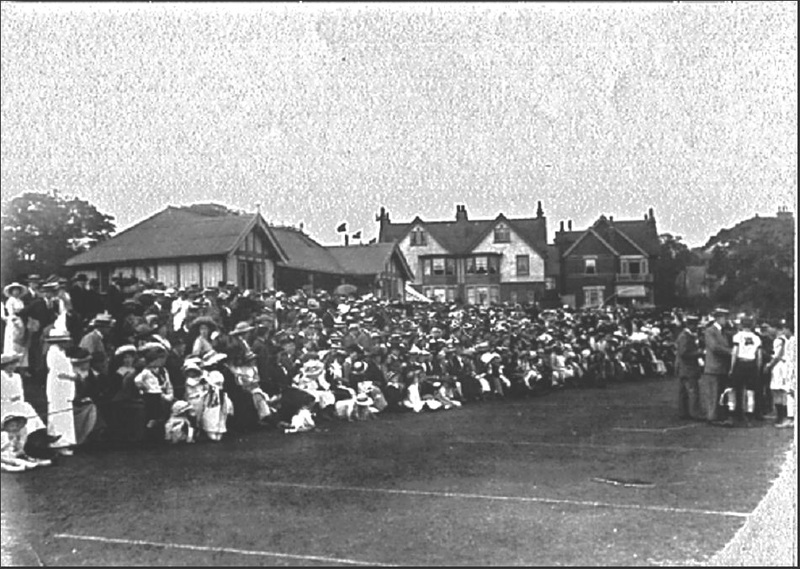 Spectators were entertained by the band of the Robin Hood Rifles, under the directorship of Mr A.Pounder. The sports should have taken place the previous Saturday, but the rain was so torrential that this was completely impossible. 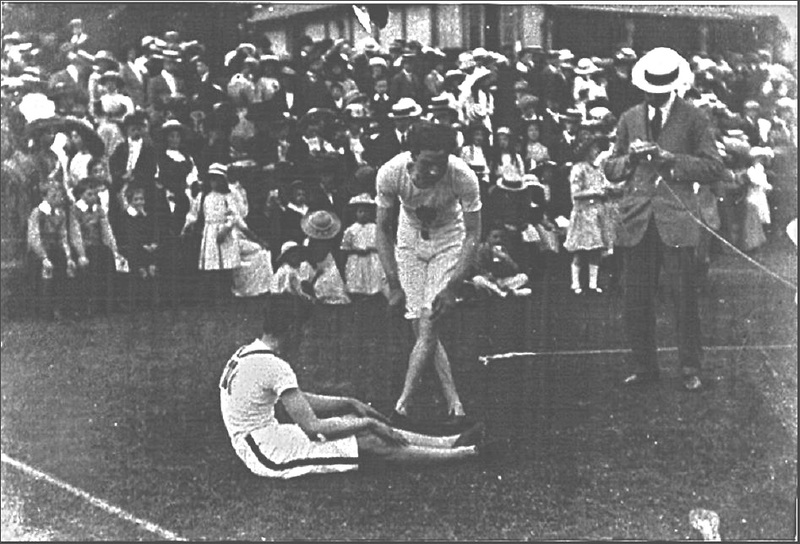 Events included the usual ones, such as the 220 yards football dribbling race (R.B.Wray in 35 seconds) and the U-11 race over 75 yards (F.C.Tonkin, 10.8 seconds). There was a one mile bicycle race won by H.E.Mills (3 minutes 9.6 seconds) after the other two competitors, S.S.Parkinson and P.H.Hart collided with each other and both fell off. H.E.Mills also won the potato race this year. J.H.Simpson won the U-11 obstacle race where competitors had to crawl through barrels and under pegged down clothes. The event created “much amusement”. The Old Boys won the tug of war against the Masters & Boys. 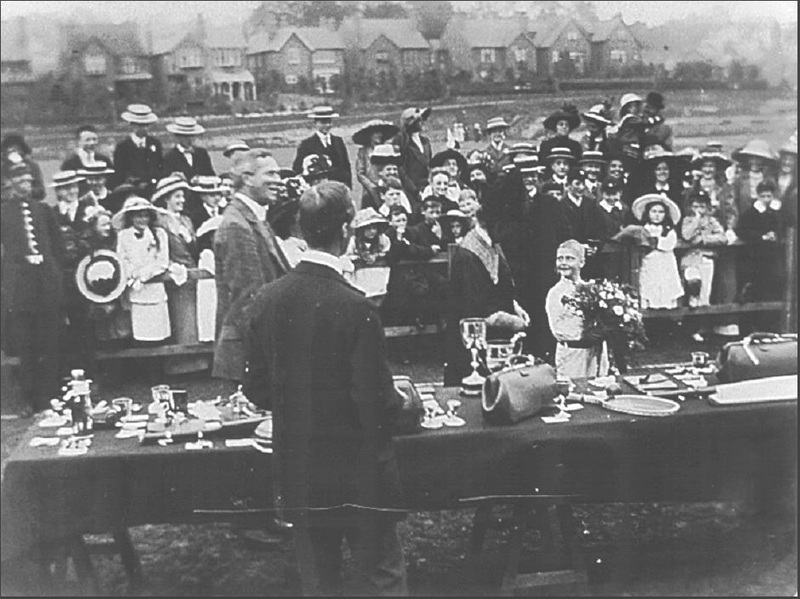 As war clouds slowly gathered, on the afternoon of Saturday, June 15th 1912, the Athletic Sports were held in splendid sunshine, again at Mapperley. The attendance was very large, and great interest was generated. Harold Ballamy ran 100 yards in 10.6 seconds, a marvellous performance on grass and wearing, presumably, ordinary pumps. There was again a football dribbling race, won by R.L.W.Herrick. This latter event was by now the only survivor of the many unusual and interesting events which had previously characterised the Victorian and Edwardian sports days. Now, virtually every event was a serious sporting trial. It should still be possible to establish the exact location of the majority of these events. I am sure that the all large Victorian houses in the background will still be there. 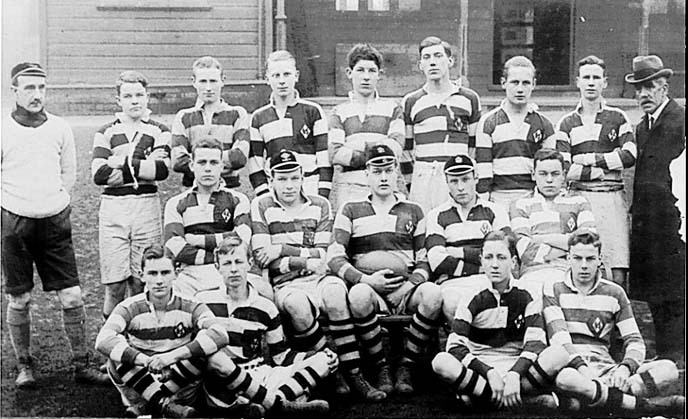 The very first game of Rugby in the long history of the High School was played on Friday, December 26th 1913, the last Christmas and the last Boxing Day before the outbreak of the Great War. 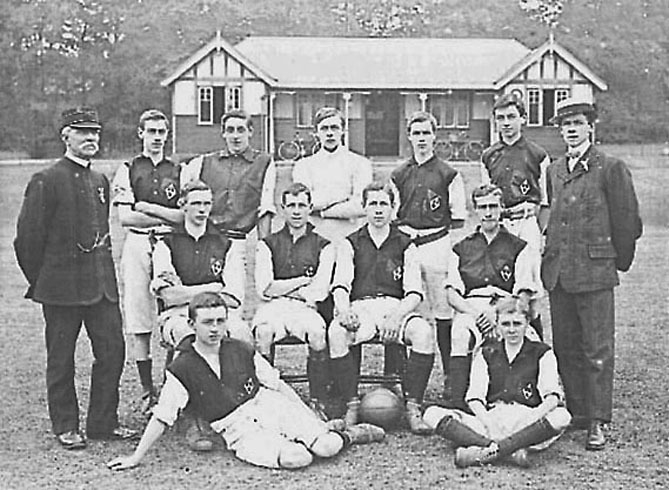 The game took place on the High School’s playing fields at Mapperley Park Sports Ground , used by the school since 1897, when they had left the Forest Recreation Ground which was considered to be too dangerous for boys to play sport there. 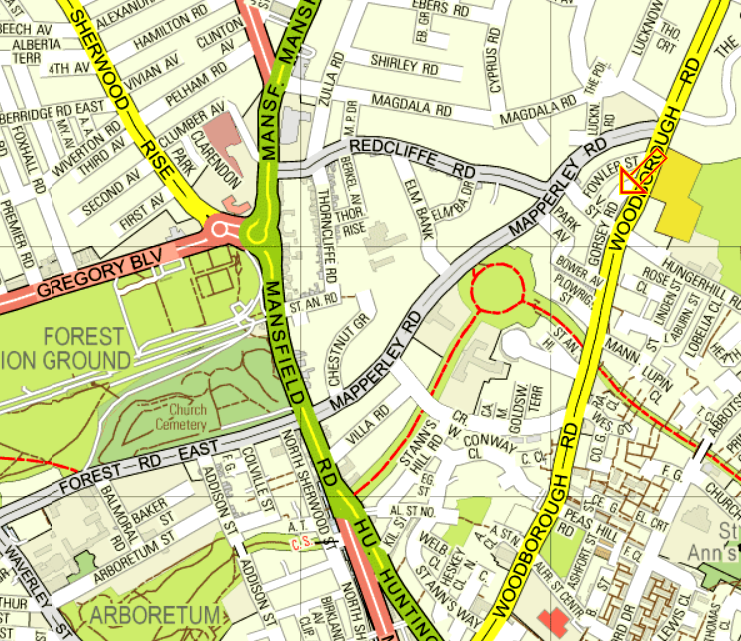 This map shows the walk from the High School (which is in the bottom left on the opposite side of the yellow road from the “C” of “Cemy”) down to Mapperley Park in the centre right, indicated by the orange arrow. 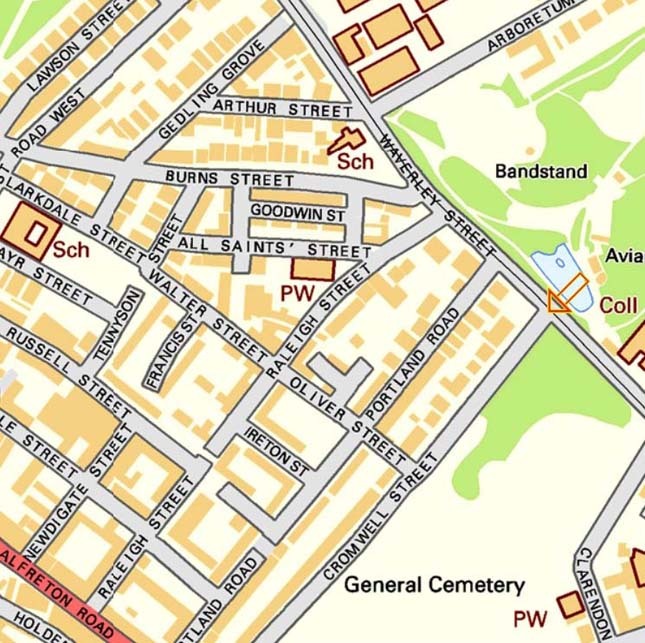 The present day Games Field, at Valley Road, is the blue word “Day” in the top left hand corner. 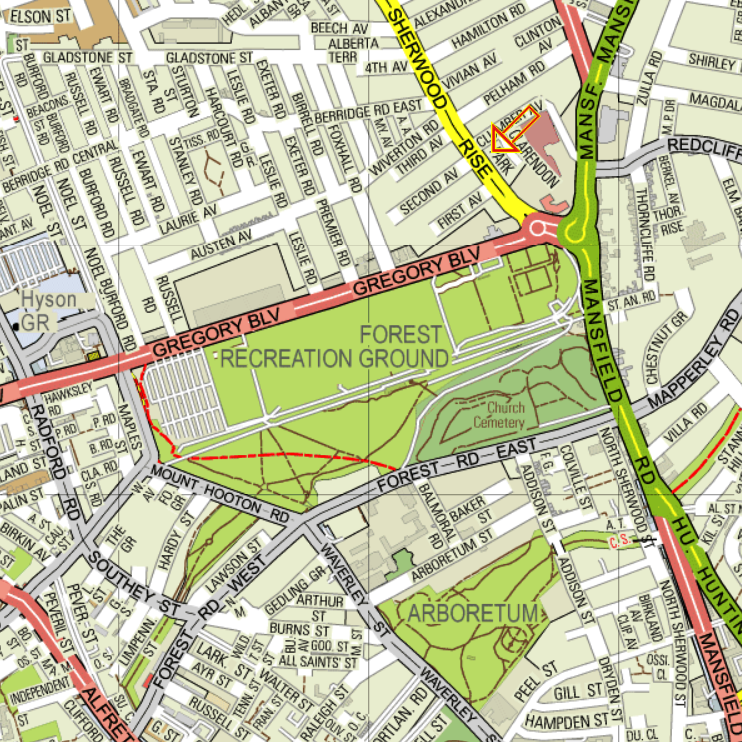 This map shows the site of the Sports Ground in greater detail. Look for the orange arrow again. This is the Pavilion at the Mapperley Park Sports Ground which was demolished only within the last twenty or thirty years . 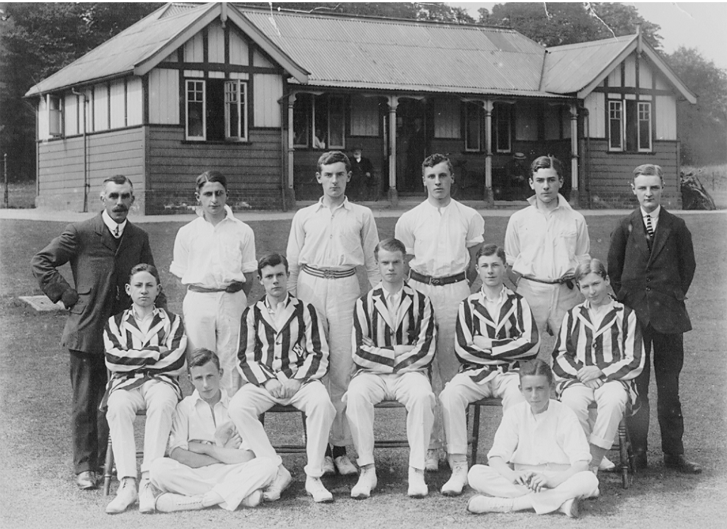 The young men are a long forgotten First XI school cricket team from just a few short years before the Great War. The gentleman on the left of the back row is Mr.Albert Grant Onion, the groundsman. He coached the High School cricketers with great enthusiasm, and saw many of them go on to do very well with local clubs. In 25 years, he did not miss umpiring a single 1st XI fixture, and was famed for his fairness and impartiality. He and his wife and daughters were responsible, too, for preparing all of the teas for the players. 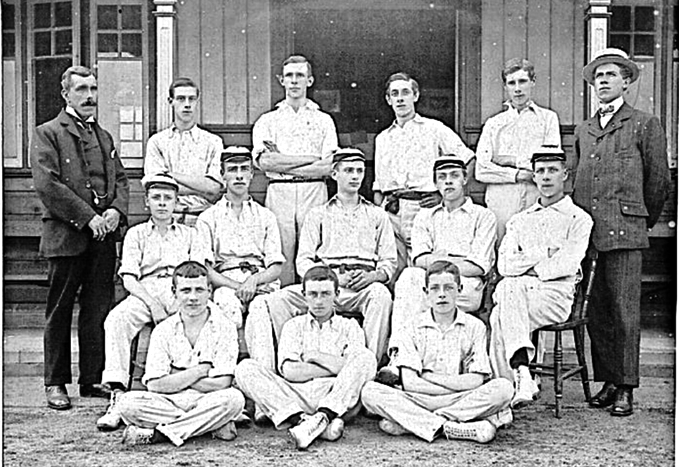 The young man at the other end of the back row is probably the team scorer, who kept an exact record of the game. Alternatively, he may be the reserve player, the so-called twelfth man. On this occasion though, on Boxing Day, 1913, it was not a cricket match but a rugby game. As a preliminary before the school’s changeover from Football, which was played from 1870-1914, to the new sport of Rugby Union, therefore, the Old Nottinghamians played against Notts Rugby F.C.. The Old Boys lost a closely fought game by (three tries) 9 points to (three goals), 15 points. The tries were scored by H.A.Johnstone, C.G.Boyd and D.P.C.Grant. The referee was Mr.Lionel Kirk. Presumably, this fixture served for many people as a demonstration of the new sport. 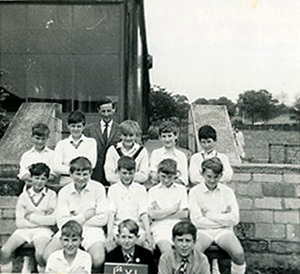 In the days before television, the majority of Old Boys and Masters, and especially the parents and current pupils, would probably never have seen the game played before. The Old Boys’ team was Stocks; H.A.Johnstone, H.S.Stocks (Captain), A.Willatt, R.L.W.Herrick, C.G.Boyd, W.Johnstone; D.P.C.Grant, F.Hardwick, J.K.Turpin, A.R.S.Grant, H.W.Ballamy, L.W.Peck, E.G.Hogan and W.S.Facon. A pleasant interval in the Christmas festivities, one might think, a little respite from a surfeit of roast turkey, brussels sprouts, Christmas pudding, port, sherry, cigars and all the other indulgences of this wonderful time of year. Except that nobody who was there on that fatal Friday knew that a World War was to break out within less than eight months. 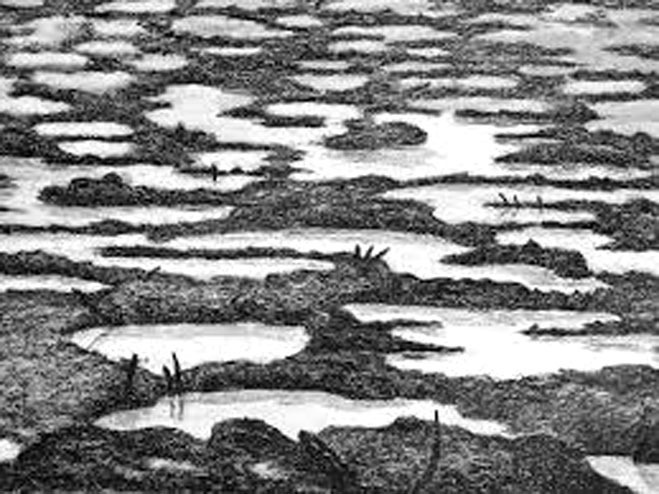 That more than four years of fighting would leave almost a million British dead, and in that number would be more than three hundred Old Nottinghamians. In actual fact, the eventual fate of the members of the Old Boys’ Rugby team pretty much defies belief. 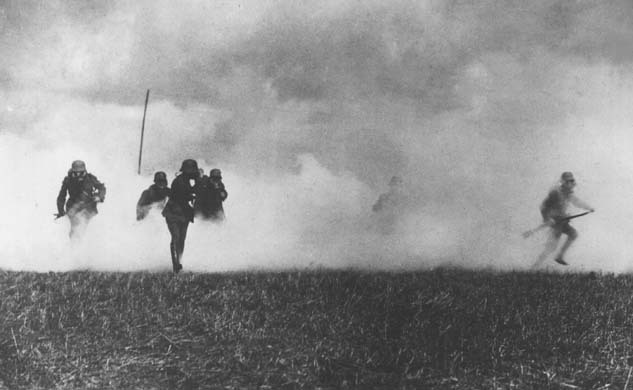 As well-intentioned, patriotic, decent, optimistic, courageous and athletic young men, they were to run forward into the maelstrom of the Great War as if it were a blood spattered combine harvester. Henry Archer Johnstone became a Major in the 152nd Brigade of the Royal Field Artillery. He was the beloved son of John and Ada Johnstone, of Fairmead, Risley, Derbyshire. Henry was to die on Tuesday, May 21st 1918, at the age of only twenty eight. He is buried in Wancourt British Cemetery near Arras in northern France. His rugby playing days were finally over. 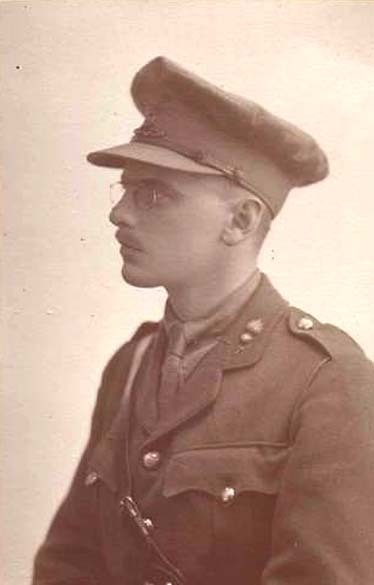 H.S.Stocks, who left the High School in July 1904, was eventually to become a Lieutenant in the 7th (Service) Battalion of the Royal Sussex Regiment. He was severely wounded on Friday, July 7th 1916, in the Battle of the Somme, and rendered unfit for further active service. I would certainly have been very surprised if he ever played any more Rugby matches with his young laughing friends. John Riversdale Warren Herrick was a Captain in the “2nd King Edward’s Own Gurkha Rifles (The Sirmoor Rifles). He was in the 3rd Battalion attached to the 11th Gurkha Rifles when he was fatally wounded on active service in Iraq. 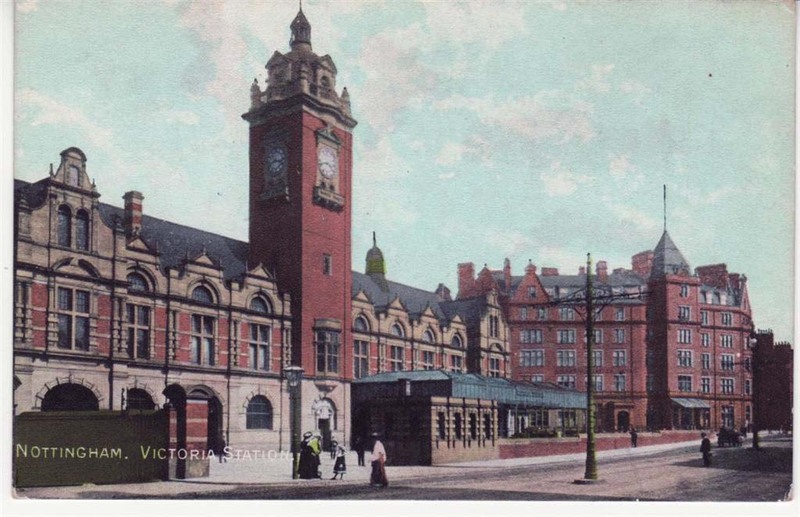 The son of Dr.R.W.Herrick and Mrs.Edith Herrick of 30, Regent Street, Nottingham, Captain Herrick was to die from his wounds on Sunday, October 24th 1920 at the age of only twenty seven. He is buried in the Basra War Cemetery, Iraq. His rugby playing days were finally over. Charles Gordon Boyd was a Second Lieutenant in the 7th Battalion of the Sherwood Foresters, but was attached to the 9th Battalion of the Leicestershire Regiment. On Thursday, May 3rd 1917, he was killed whilst attacking Fontaine-Les-Croiselles with ‘D’ Company at the age of only twenty four. He was the son of George Herbert Boyd and Sarah Louisa Boyd, of, initially, 13, Tavistock Drive, Mapperley Park. Charles Boyd had been the Captain of the School in 1911-1912. In cricket, he was the First Team’s wicketkeeper and he was an enthusiastic footballer who played regularly for the First Eleven. His full record as a goalscorer was eleven goals in nine appearances. He surely got changed for this particular fixture in his own home nearby and perhaps walked along Tavistock Drive to the pitch in a laughing little group of his fellow players. At the time of his death, his parents had moved to St Peter’s-in-Thanet, Kent. 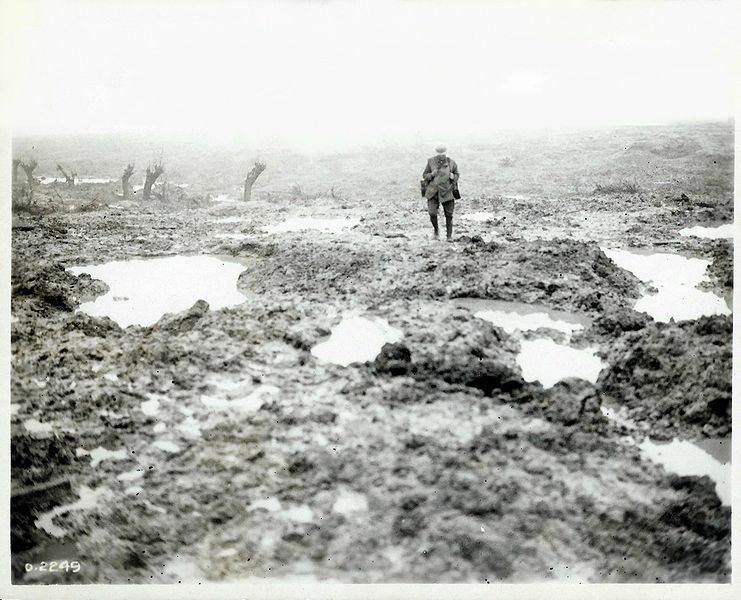 Tragically, Charles Boyd’s remains were not found until some six years after his death, in November 1923, when he was reburied in the Heninel-Croisilles Road Cemetery in the Pas-de-Calais in northern France. His rugby playing days were finally over. James Knowles Turpin was the beloved only son of Harry and Minnie Turpin, of 68, Henry Road, West Bridgford. James was a Second Lieutenant in “A” Battery, 241st South Midland Brigade of the Royal Field Artillery. On Tuesday, August 14th 1917, he was killed in action at Boundary Road behind the Brigade HQ at Hill Top Farm near St Jaan just west of the frontline. he was just twenty five years of age. He was buried in Plot 6, Row D, Grave 7 in Vlamertinghe New Military Cemetery, West-Vlaanderen, Belgium. His rugby playing days were finally over. 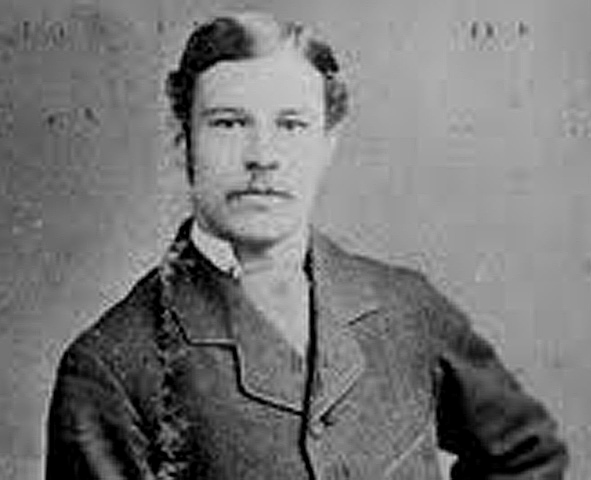 Allan Roy Stewart Grant, while he was at school as A.R.S.Grant, was nicknamed “Pongy” by his fellow students, because of his parents’ choice of initials for him. He served as a Captain in the 10th Battalion of the Seaforth Highlanders, Ross-shire, Buffs, and the Duke of Albany’s. He was awarded the Military Cross. “Pongy” survived the conflict and duly returned to Nottingham. Not so his elder brother, Donald Patrick Clarke Grant, who was in the 7th Battalion of the Cameron Highlanders. He is listed as either a Lance-Corporal (by the Commonwealth War Graves Commission), or a Lieutenant (in the school lists of the fallen). He was killed on Thursday, April 12th 1917 at the age of only twenty seven. 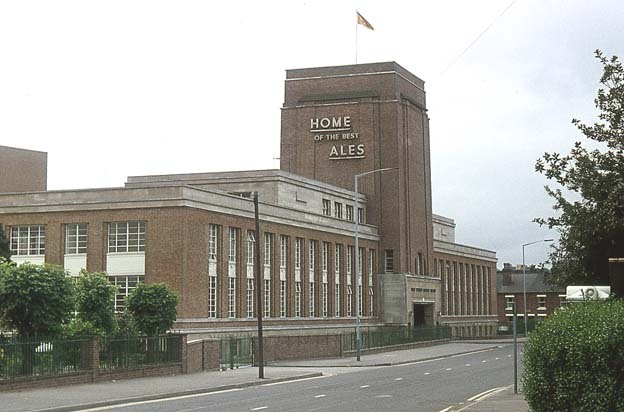 He had previously been the Manager at the British Crown Insurance Office in Nottingham. His remains were never found but his death is commemorated on the Arras Memorial. Both young men were the beloved sons of the Reverend John Charles Grant, a Minister of Religion, and his wife Ellen Jemima Grant who lived at “The Manse” at 16, Baker Street, Nottingham. The family was of Scottish origin. Donald had, in actual fact, been born at Loanhead in Midlothian. Harold William Ballamy was a Lieutenant in “B” Battery of the 231st Brigade of the Royal Field Artillery. He was the beloved son of Frederick William Ballamy, a commercial traveller, and his mother, Mrs.M.A.Ballamy of 17a, Gedling Grove. 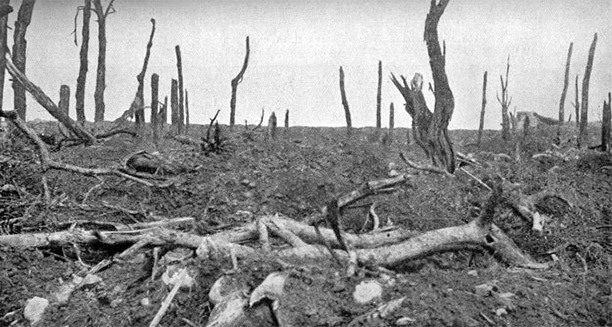 He was killed on either Tuesday, August 14th or Wednesday, August 15th 1917, as part of the Third Battle of Ypres, usually known as the Battle of Passchendaele. He was twenty four years of age, and is buried in Fosse No 10 in the Communal Cemetery Extension at Sains-en-Gohelle, in the Pas-de-Calais in northern France. His rugby playing days were finally over. Leslie Wayland Peck was the son of Thomas Wayland Peck, a Clerk in Holy Orders, and a Diocesan Inspector of Schools, who had been, from 1885-1900, a master at the High School. From 1886-1893, despite being a teacher, Peck Senior had played regularly for the school’s First Team at both football and cricket. 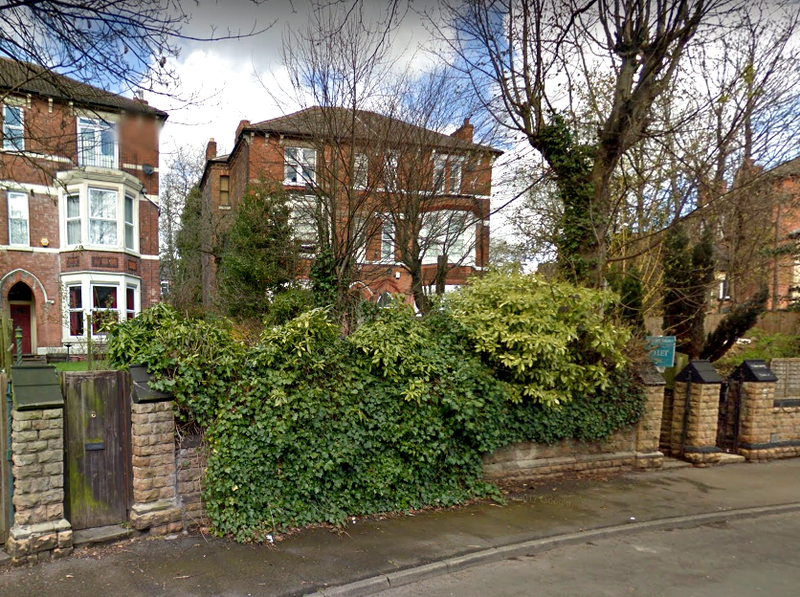 The family lived initially at 12, Arboretum Street, Nottingham, and then in Gedling Grove. He must certainly have known Harold Ballamy, a near neighbour. Perhaps the two boys used to make the short walk to school every morning, accompanied by Mr Peck. What could have been more embarrassing than walking to school with one of the teachers? Fortunately it was a very short walk. Today it would just necessitate crossing over the tram lines at the High School tram stop. Leslie Peck left the High School in June 1910, and joined the Bank, an establishment which was later to change its name to the National Westminster Bank. He had already served in the School Cadet Corps under Captain Trotman, and then joined the Sherwood Foresters Special Reserve. He was called up, and sent to France quite early in the Great War. He was “Mentioned in Dispatches”, but after being extremely badly shell-shocked, was invalided back home for a period of hospital treatment. Leslie was then posted back to the Sherwood Foresters, but was never well enough to serve overseas again. I would certainly have been very surprised if he ever played any more Rugby matches with his young laughing friends. 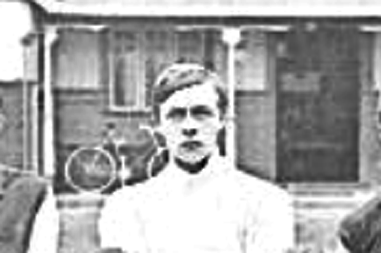 M.J.Hogan was the school goalkeeper from 1903-1905. In the Great War he became a Sergeant in the 1st Battalion of the Grenadier Guards. He was severely wounded on an unknown date. His goalkeeping days, and his rugby playing days too, were probably over for ever. I have been unable to trace anything concrete for W.S.Facon although according to the London Gazette, a Lieutenant W.S.Facon was promoted to Captain on December 21st 1921. The Internet also reveals that in the Air Force List for May 1939, a W.S.Facon worked at the Air Ministry in the Department of the Permanent Under-Secretary in the Directorate of Contracts.